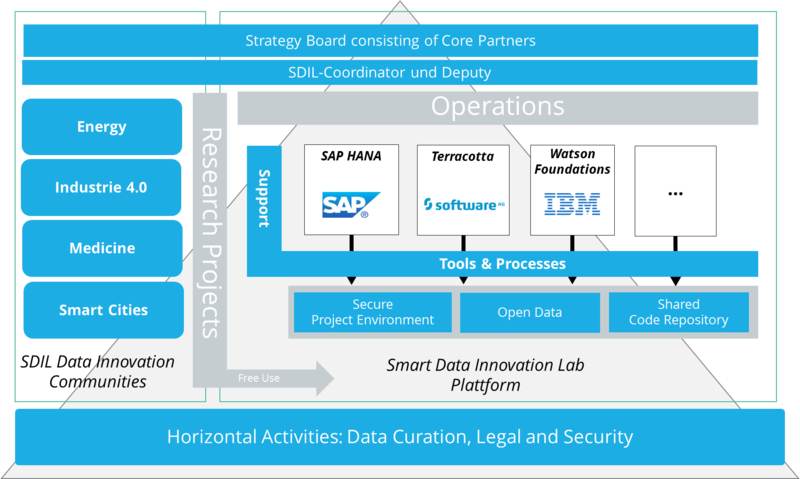 The Smart Data Innovation Lab (SDIL) offers big data researchers a unique access to a large variety of Big Data and In-Memory predictive analytics technologies (e.g. SAP HANA, IBM WATSON, Software AG Terracotta). Industry and science collaborate closely in order to find hidden value in big data and generate smart data. Projects are focused on the strategic research areas of Industrie 4.0, Smart Energy, Smart Cities and Personalized Medicine. In order to close today’s gap between academic research and industry problems through a data driven innovation cycle the SDIL provides extensive support to all collaborative research projects free of charge (applications are accepted via the web site). SDIL provides access to experts and domain-specific skills within Data Innovation Communities fostering the exchange of project results. They further provide the possibility for open-innovation and bilateral matchmaking between industrial partners and academic institutions. Template agreements and processes ensure fast project initiation at maximum legal security fit to the common technological platform. A standardized process allows anyone to set up a new collaborative project at SDIL within 2 weeks. Furthermore, it actively lists data sources such as CrowdSignals.io and lists relevant code artifacts to augment the unique industrial grade solutions provided within the platform. SDIL is a community effort from both industry and academia in Germany coordinated by Prof. Michael Beigl’s team at TECO. The Karlsruhe Institute of Technology runs the platform. One use case for CrowdSignals.io data that will be investigated by KIT TECO in personalized medicine is investigating correlations between interruptibility of a user and their context for field research and surveying. They expect to be able to infer interruptibility rules to implement a smart notification management system. It shall handle notifications with respect to the user’s interruptibility with the objective to improve user experience.